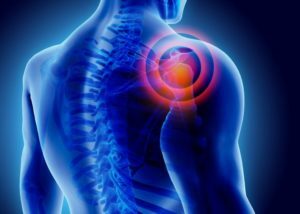 What is Shoulder Pain and Shoulder Stiffness? Shoulder pain is a common complaint in people who see a chiropractor. Most people have observed some sort of shoulder complaint at some point in their lives. A lot of shoulder complaints tend to come and go, or stay in the background with a low level of pain. This makes it a region of the body which is often ignored by many people, which sometimes leads to more chronic and serious problems. People usually observe pain with movement of the shoulder in certain directions, as well as general stiffness. Muscular imbalance due to computer work posture. Imbalance from over training pecs, lats or anterior deltoid muscles. Frozen Shoulder (also known as adhesive capsulitis). Can Chiropractic Treatments Help With Shoulder Pain and Stiffness? Chiropractic treatments are very effective in resolving shoulder pain and shoulder stiffness, allowing proper alignment and function of the shoulder girdle. As always, some conditions are easier to treat than others. In most cases of shoulder pain, a chiropractor will use a lot of soft tissue techniques in order to address the muscular problems present in the shoulder. Changes to lifestyle and specific exercises will be given in order to rehabilitate the shoulder fully. Are There Shoulder Pain and Shoulder Stiffness Exercises? Specific exercises for the shoulder will be completely dependent on the problem which a patient presents with. Shoulder exercises are a very important aspect of shoulder care. A patient’s speed of recovery is usually dictated by how much they stick to their exercises. Once you have had your first visit, a plan of care will be discussed with you in order to improve your shoulder issue as quickly as possible. Shoulder pain and shoulder stiffness are common complaints, but are often left until they are chronic before people seek help from a chiropractor. However, with chiropractic adjustment, soft tissue techniques and a specific exercise plan, shoulder problems can be quickly and effectively treated.